The Picross e series has been rather popular on 3DS, or at least we assume that's the case as there have been six entries so far. Basic logic puzzle solving rewarded with a pretty picture is a golden idea, clearly, and this particular style is now coming to Wii U.
PixlBit Studios has confirmed that its title, PixlCross, is now in lotcheck ahead of release on the Wii U eShop; it's also trying to get Greenlit on Steam. Though the aesthetic is simple the content on offer seems promising - there are over 150 puzzles (some of which are hefty 35x35 grids) and, more intriguingly, a level creation tool. Utilising the GamePad it looks like an intuitive, simple way to create and share Picross puzzles. There'll be options to browse and download others' puzzles and so, in theory, there could be a neverending supply to keep you amused. We'll see how this one shapes up when it's released. Are you tempted by it? Great. I have a pile of Picross puzzles waiting for an audience though some of them are too big and hence I can't recreate them in PixlCross. If I get enough positive feedback from my smaller puzzles I might reprogram my own Picross program which I made half a year ago and make it available to everyone. I would like to see this on the 3ds. Picross is stale. If it were doing ok it would be more then just a puzzle pack at this point as there have been no software changes since e4. A way to create and share puzzle would effectively shut that down and might make them innovate again. Picross 3D on the DS was the last innovation and that was DS. it also by hal and not jupiter. 35x35 is a welcome change. I would have rather them use icon sizes like 16x16, 24x24, 32x32, etc as there are already unlimited pictures in those sizes already. I'm looking forward to this one, the gamepad suits the larger puzzles. Finally! I've been whining for a Picross game on the Wii U for the longest. And a level creator? I'll definitely be picking this one up. Picross will translate well on the gamepad. What took so long?? I agree with everyone else. Why wasn't this done sooner?! Hopefully it reaches Europe/Australia. 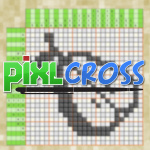 @Rob_mc_1 Regarding the sizes, picross puzzles use 5x5 grids to make counting easier. It would be a bit weird to have just a part of a 5x5 box and it would be even weirder to have 4x4 boxes since many have become used to counting with 5x5. Nothing is stopping you from using 35x35 grid and just use 32x32 pixels though. Hey guys, this is Nick from PixlBit Studios. Thanks so much for the great write up. It's very exciting to see the reaction to the game so far. We've kept it under wraps for quite a while and didn't really want to show anything until we were sure it was up to snuff. As mentioned, we're in Lotcheck now for an NOA release and after we make a little bit of money, we'll be filing for rating in Europe (it's really expensive!). In the meantime, we're running a Steam Greenlight campaign (also mentioned), so hopefully that goes well. If anyone has any questions about the game, feel free to shoot them at me, I'd be glad to answer! Also, @Late has it right - all the puzzles in the game are in increments of 5 to make counting easier. And to address your other point, the 35x35 max was really a limitation imposed by the Wii U. Despite many rounds of optimization, the experience suffered greatly on any puzzles greater than that. The PC release will likely have the limit bumped up thanks to both the better performance and the increase in screen size. @PixlBitStudios I'll buy your game once it's available in Europe (hope it won't take too long). How fast is it to calculate if the puzzle is solvable with just one answer? I've used some free program trial in order to see if my puzzles are solvable (max size 150x150) and it can sometimes take quite a while to calculate everything. Though it does show every possible solution even when there are thousands of them. Does your game stop as soon as it recognizes that there are more than one solution? I'm interested since Nintendo's Picross series and Nonogram puzzles are close to my heart and I'm also a game engine programmer student so I'm interested in your optimization techniques. @Late Very cool! The solver I wrote for the game can solve puzzles very quickly, but it's only interested in puzzles with a single solution. Once it determines that there's more than one solution it stops and informs the user. I can believe that solvers looking for all possible solutions take quite a bit longer, because they need to use brute force to determine the solution. Without getting too technical... my solver will take a look at a set of hints and a given line and attempt to line up the blocks/spaces as far to one side and then as far as possible to the other, then finds the places where things overlap and fills stuff in. It proceeds down the horizontal lines and then the vertical lines until it can either make no more moves or the puzzle is solved. So basically actions made on the horizontal lines will inform actions on the vertical lines and vice-versa, just like a human playing the game. From a game design perspective, we thought it was more important to produce puzzles/enforce creation of puzzles that are without ambiguities. Those puzzles tend to be less frustrating to solve because all of the tools you need to solve it are stored within those hints. I'll be sure to keep everyone here posted on our progress on a NOE release shortly after our NOA release (hopefully) soon! @PixlBitStudios Thank you for your answer. That's what I thought. It's an unnecessary thing to calculate and print every solution in a game like this although seeing where the multiple solutions are, helps to fix the puzzle faster. I'm used to start by creating pixel art, try if it works and if it doesn't I'll fix it until it does. Usually the fixing part takes longer than making the original image since it's pretty much trial and error at times. I'd be interested in trying to program something that gives you an idea how to easily make your unsolvable puzzle solvable but it can be pretty hard since the program can't really see the big picture. @Late Definitely true. While I wasn't the one making puzzles - my wife was in charge of that and all of the design - she spent most time fixing puzzles that were started from pixel art on graph paper. Doing stuff like eliminating (or emboldening) single pixel diagonal lines or adding other stuff to the picture usually helped make things more solveable. We also show the progress that the solver was able to make so that you have a general idea of how close you are. Doesn't Nintendo own the Picross license? How did it end up on Steam Greenlight? Oh, sweet. I love picross puzzles and I will definitely get this. 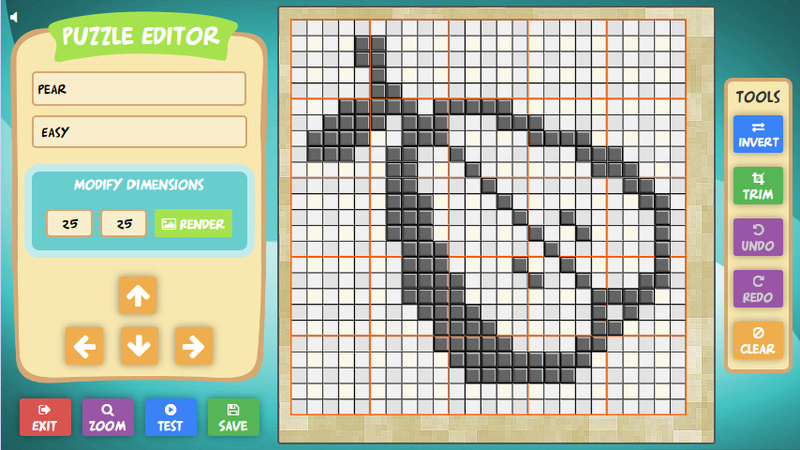 I've been making a picross game just like this one on and off for quite some time. It's mostly for my own amusement, but some of the features are pretty much exactly the same ha ha. @TheDavyStar No, Nintendo doesn't own the Picross license. It's mostly no one else has really tried to capitalize on electronic versions of the game and had success with it. @PixlBitStudios How colourful do the designs get for the pictures? Kind of curious about that since the pictures here and on Steam don't show too much variation. @Ernest_The_Crab I'd say that the designs for the puzzles get quite interesting and tread new ground when compared to past Picross games. As Picross enthusiasts, two of our biggest complaints about those puzzles have been that many are very similar and a lot of the puzzles don't particularly look like the thing they are supposedly depicting until color is slapped on it and it's shown in the puzzle select screen (or animated). My wife, Francesca, made a point of making very diverse puzzles that actually look like the thing it says it is. I wish I had a way of showing that off without spoiling all the content in the game, but as it stands, we've tried to only spoil the stuff that's more mundane. I'm putting together a little demo right now that will have a sampling of puzzles from the game, so when that's available, I'll be sure to let everyone know and you can see for yourself! I do enjoy a good picross game and have been wanting a touchscreen one on the Wii U. Glad to hear it's slated for a European release. I'll be over this if/when it gets to Europe. Fingers crossed for American success! @linforcer If you don't mind me asking, would you be willing to elaborate on what you don't like about the interface? Again, it's not like I'm an art critic, I can only tell you what looking at the trailers and screen shots makes me "feel", it's not like I am able give very constructive criticism here (Maybe if I had a degree in graphic design I'd have more useful answers). @linforcer Thanks for the detailed response. I can understand just generally not appreciating the art style. We did work very hard to create a cohesive style and went through many iterations before arriving at the final product. Of course, like anything creative, it's not always going to appeal to everyone. The feedback caught me a bit off guard because the interface has been the thing we've gotten the most positive comments on. That being said, despite your feelings on the art, if you like this style of game, I do hope you give ours a shot. We think the actual puzzles are pretty great and we've made it an effort to create a product that we believe is both feature rich and a good value. It's just a little demo I made to practice SFML since we had to make a game with it and I thought it'd be better to make something I've thought about making earlier, before trying to advance our real project. For the real project we worked in pairs and me and my pair programmed a Tetris clone (although it had a mode which to our understanding haven't been done before). My Picross program takes an image file from a folder and calculates the numbers and prints the play field. You can naturally use mouse buttons to fill or cross blocks and once it's ready the game congratulates you. It checks when it's ready by comparing the original image to what you have currently filled. They are ready and have only one solution. If the price is right, I will be all over this. I still need to start playing the 3DS Picross e series, but I sort of want to wait and see if a wild bundle appears with all 6 of them for a decent price. Wishful thinking I know but I rarely ever buy games at full price, I was raised to bargain hunt. I like picross a lot, so I may download it (if the price is right). @Late That's awesome! Looks like you made some great progress for a prototype on a technology you just learned. Your pixel art also looks fantastic - hope it's something you can leverage in the future. I'm sure any of those would make phenomenal puzzles. @AshFoxX & @Henmii Thanks for the kind comments. As far as price, we're targeting $5.99. Hopefully that's reasonable enough for you guys to consider it at launch! @PixlBitStudios Thank you! I made my program in a week (although I had thought of how to make it for a month or so, nothing written down but it helped a lot to have some kind of idea how I'm going to make it work) and haven't touched it since. I'll get back to it someday although I'll most likely start from scratch. The pricing of your game seems fine to me. I'll be there waiting for the eShop to update once the game is ready to be launched in Europe.